Day 4 - Slept a little more today as we were too shagged from USJ. We were prepared for a day of nomming as we had lots of cravings to satisfy. 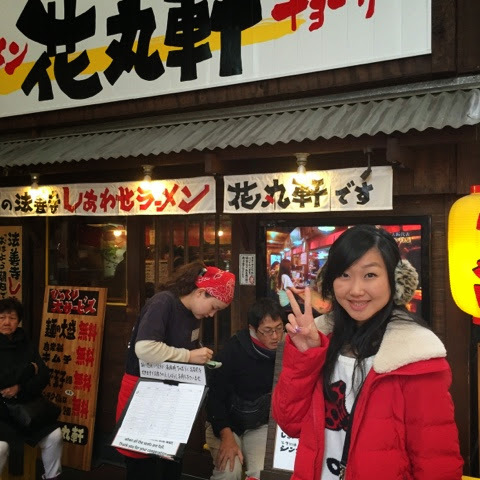 1st stop was at a humble eatery specialized for their beef okonomiyaki. 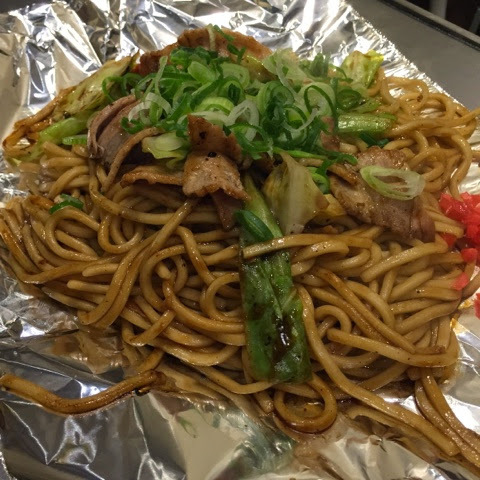 We had the pork yaki soba and seafood okonomiyaki since there was not much on their food menu besides these two types. Can't decipher the name of this place but it should be pretty famous as we have seen queues outside the restaurant before. The noodles was quite bland and lacks flavour. Pork slices were tender while generous amounts of cabbage and spring onions was added for the crunch. If only it was cooked with more spices. 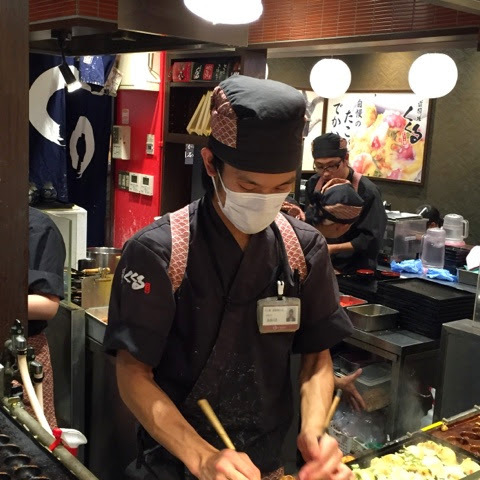 Our okonomiyaki was not as disappointing and the wait was worth it. There was a good balance of cabbage and flour used to deliver the pancake that was topped with teriyaki sauce, mayonnaise and last but not least, bonito flakes. 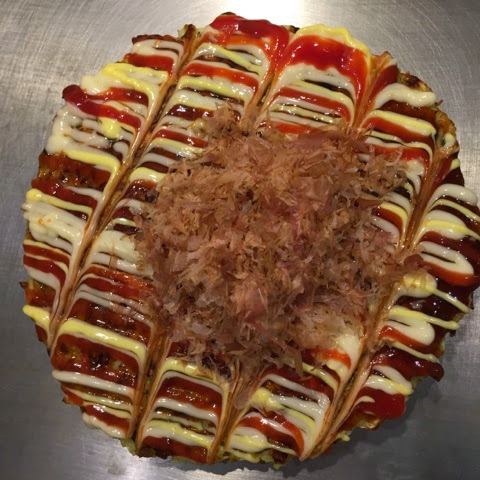 How to eat a okonomiyaki? 1. Prepare yourself with a pancake cutter. 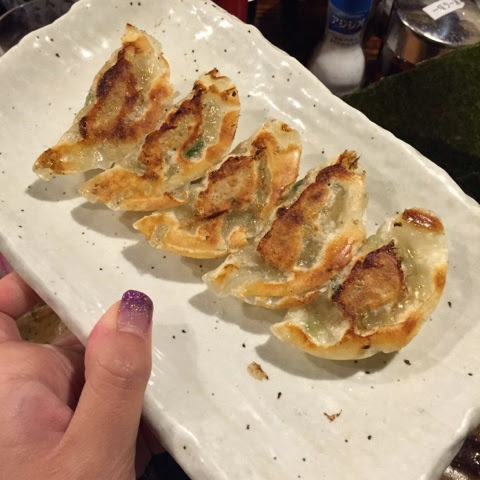 Expect that the okonomiyaki will either be cooked and placed in front of you or at some places, cooked before you. 2. Spread the bonito flakes evenly atop the pancake for good coverage across the area. 3. Cut it into 4 slices by lightly chopping with the cutter from one end to the other. This is so that they can be split amongst the diners or for you to take them easily after each serving. 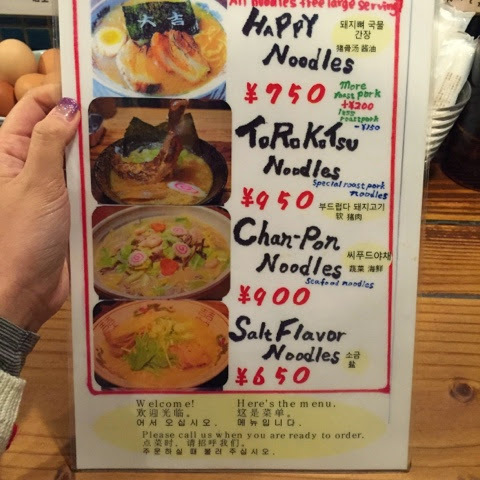 2nd stop- Hanamaruken Ramen (花丸軒・Namba outlet, Address: 1 Chome-2-1 Nanba, Chuo Ward, Osaka Prefecture, Tel: 06-6213-0131 ) We used google maps to help us. We took metro and alighted at Namba station and walked towards Namba (Nankai) station then to Dotonburi. It was about 15 minutes walk. Again, it requires us to wait for our turn, waitress put our name as 外国人 when I spoke in English. But if it helps her to remember to speak to us in English, i do not mind at all 😆. We were sat after a short wait. Free flow of eggs and kimchi (upon request) kept me occupied while waiting for the noodles. 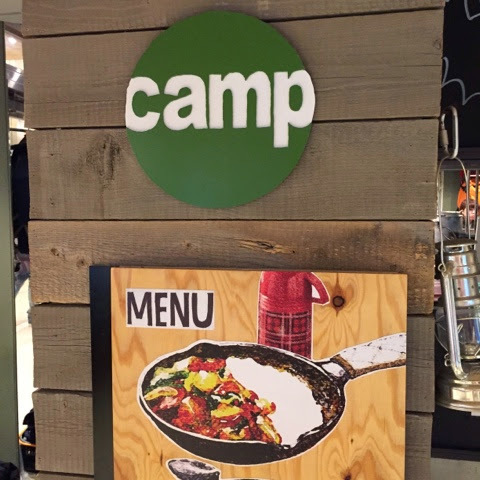 We were served shortly after ordering so you can imagine how fast the turnover rate is. 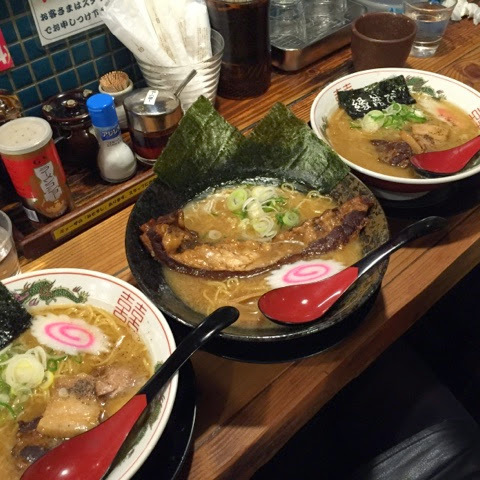 Two bowls of Happy Noodles and one ToroKatsu and one Gyoza for the three of us. We were craving for a piping hot bowl of ramen to warm our tummies so this came at the perfect time. The gyoza was not too impressive but the ramen was incredible. Each bowl is filled with goodness. Tender pork soft ribs and char siew made up the happy noodle bowl. The portion is huge and can be shared with another person if you intend to eat other things as well. You should be warned too that the slab or meat you get in each bowl is a real deal. 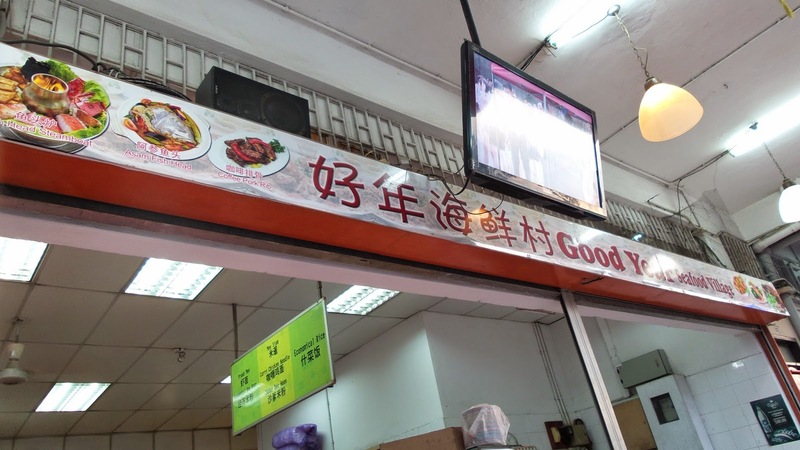 Every mouth is a bliss, the meat just melts in your mouth and the noodles are soaked with the delicious pork broth. The friendly chefs took our orders promptly and attended to our needs, such as the request for the kimchi. Our experience here is complete. Stop 3 - it started to drizzle and imagine all the umbrellas bashing with one another in the crowded streets of Dotonburi and Shisaibashi. We each used a hat to cover our heads which saved much trouble. Tea was at a cafe within the rows of shops in Shisambashi shopping street. 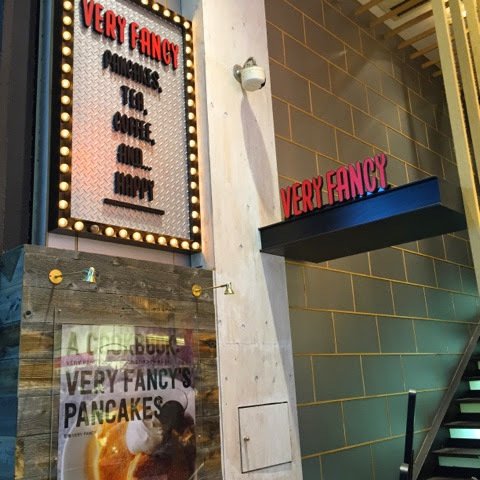 It's called Very Fancy. Located on the 2nd and 3rd floor, this hideous cafe may just lose your attention if you did not keep a look out for it. Look out for the red carpet with the letters VF in black fonts or the glamorous signboard that says the tagline of the shop. Staffs here are really friendly and sweet. Business is surprisingly good with crowd streaming on a regular basis. The cacao pancakes (1300 yen) came in three layers with strawberry slices in between and smothered with chocolate syrup and finally a dollop of non sweetened whipped cream and chocolate flakes. Had the maple latte (620 yen) to go with my pancakes. 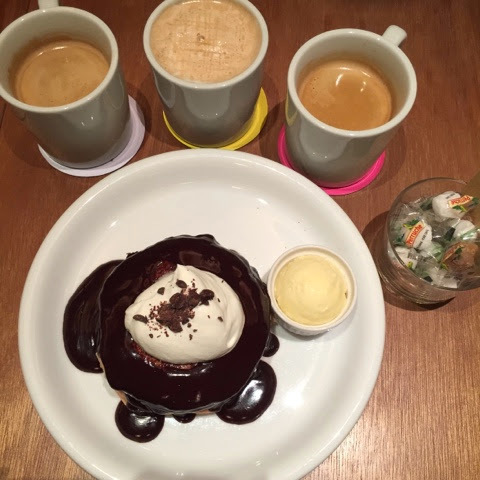 I find the pancakes average, less dense and moist than what I had at strictly pancakes. I would still recommend this cafe for a good chill out or rest-your-legs between shopping stints. 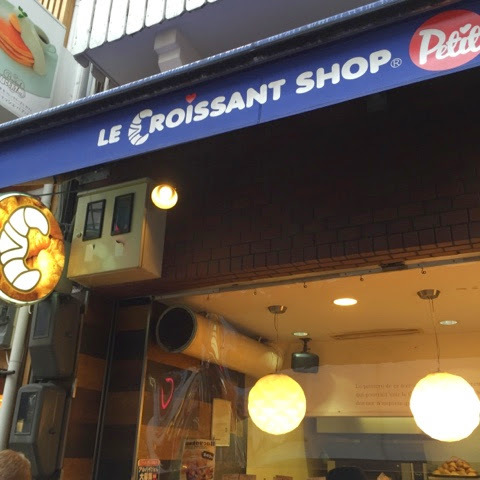 Stop 5 - get these buttery croissants on the go. 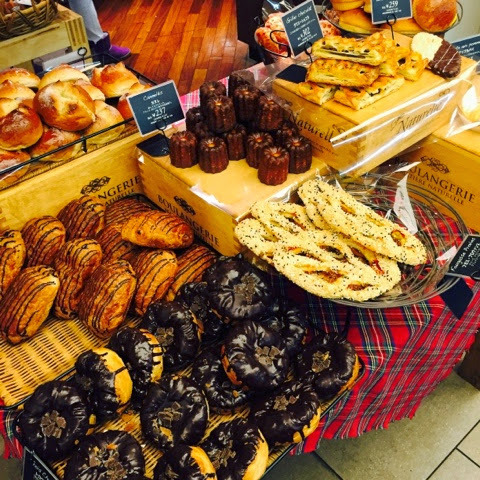 You will not miss it because the whiff of freshly baked pastries would not be able to run away from your nose. Between the blocks heading towards Shinsaibashi station, you will come across the smell which makes you walk towards the source which will be on your left. 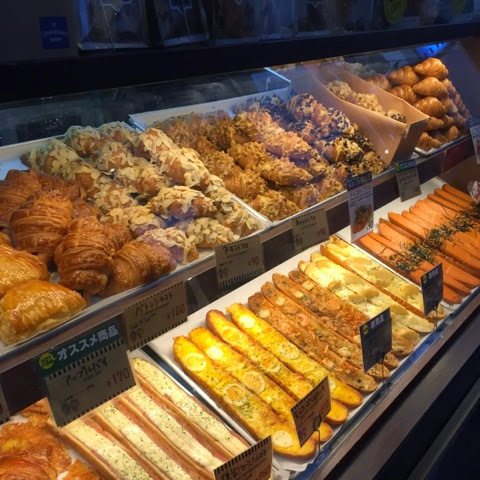 The top flavourite is the buttery croissant (one for 40 yen or five for 200 yen) and the fish roe baguette at 160 yen. Savory baguettes are quite interesting here so do try it! 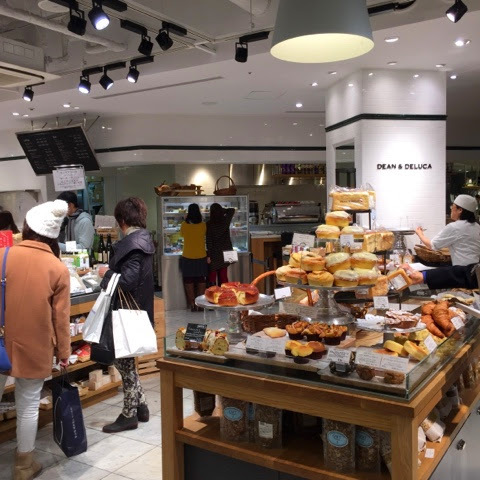 Stop 6 - if you enter into Shinsaibashi station and walk a little, you will come across Wittaya - a bakery within Daimaru. Check out their breads because it's the second time we are buying coz they're really premium in taste (and price). Stop 7- We decided to head to Umeda Sky Building before dinner. It is within walking distance from JR Osaka station or Umeda Station. You will need to cut through Grand Front Osaka to get there via an underpass. It was drizzling which makes our traveling to and fro a hassle. Even on the observatory itself, the rain inhibits us from taking any photos. Lift goes to 173rd floor from the 3rd floor. 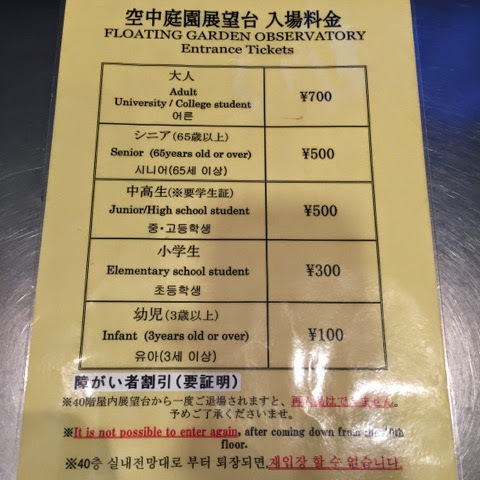 You then have to purchase tickets at 700 yen for adults and so on..
We managed to get a seat at the indoor observation area. People can sit there to take pictures and watch the bird's eye view. A rock scone and a cinnamon roll with a thick layer of cinnamon icing. 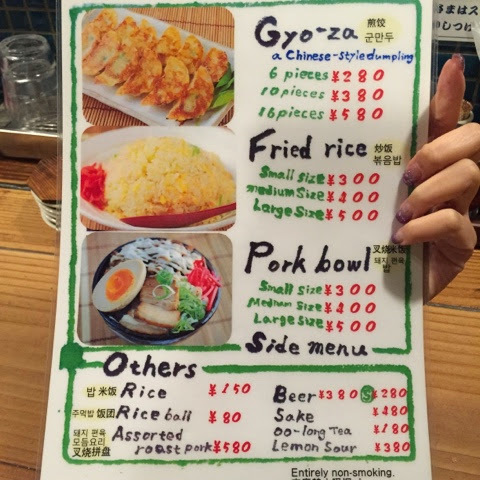 Their take out menu was in English! What did we get? A spicy curry chicken with onions (990 yen). 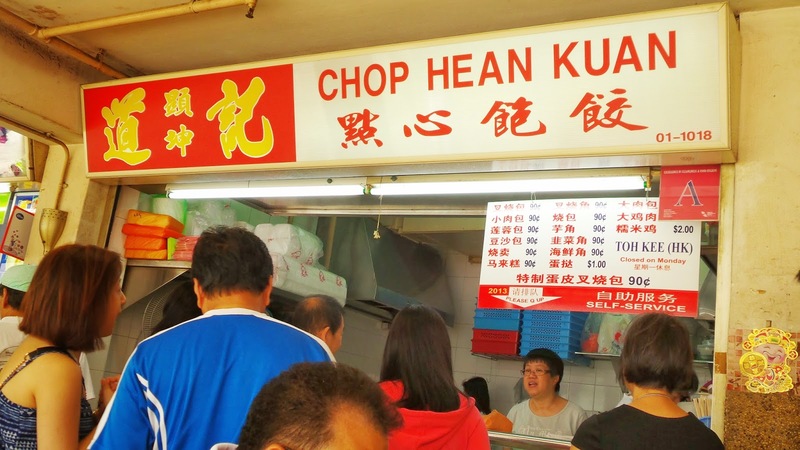 We could choose the level of spiciness and amount of rice too! 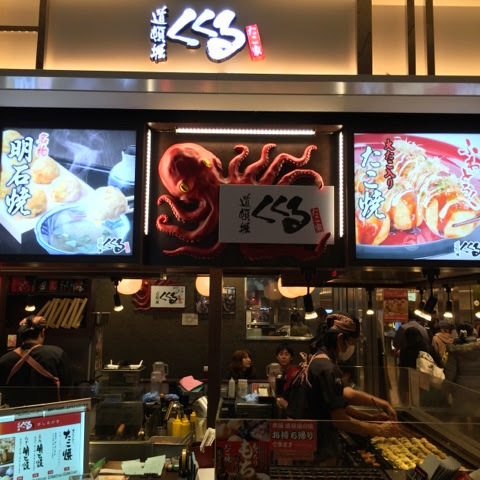 They also sell a variety of bentos, sushi etc going at 20-50% discount at all the supermarkets like Daimaru, Hanshin and Hankyu all around Osaka and Umeda train stations.